Latch Tight® Group Lock Boxes are storage devices that capture keys to provide an effective lockout of large equipment. Simply secure each lockout point on a piece of equipment with a single padlock. 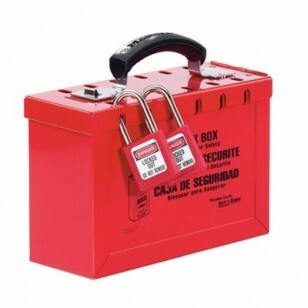 Place the keys in the group lock box and then each authorized employee places their personal padlock on the lock box. When work is compete, employees take their personal padlocks off the lock box, freeing the keys inside. Keys inside can not be accessed until the last employee removes their padlock. Exclusive Latch Tight feature ensures that keys cannot be accessed until the last lock is removed. Durable powder-coated red finish with an easy-to-grip, ergonomic handle. Accommodates up to 12 workers, more with the use of lockout hasps. Lockout message is imprinting in English, Spanish and French for easy communication to all workers.